A collection of various prototyping projects ranging from paper to VR, each completed in under a week. OneBusAway is an app meant to make public transportation easier for commuters - it provides useful features such as real-time bus arrival times as well as reminders for when your bus is arriving. For a transit system that is often inconsistent with delays and early arrivals, this app is a huge help. I use it almost daily and it helps me anticipate the bus schedule so that I can make the most of my time. I decided to create a video prototype to demonstrate the ideal experience and value that OneBusAway offers commuters like myself. I started out by analyzing the advantages of the service and then brainstormed a few scenarios that would visualize them. Then, I weighed the pros and cons of each scenario in terms of how effective it would be and how difficult it would be produce as a video. I settled on a rainy day scenario to convey a stress-free commuting experience made possible by the real-time updates of OneBusAway. The cold rainy setting and miserable commuters is a stark contrast to the warm coffee shop enjoyed by the girl, who doesn’t have to waste a single minute waiting in the rain. The video sets the scene by showing a cold and rainy day at the transit center. Commuters are miserable while waiting for their buses to arrive and some are frantically running after their departing buses. In contrast, a girl relaxes in a comfortable coffee shop and works on her laptop. Suddenly, her phone vibrates and OneBusAway alerts her that her bus will be arriving shortly. Calmly, the girl packs up her belongings and heads towards the bus stop. Right as she arrives, her bus pulls up and she gets on. As the girl sits down, she checks OneBusAway to see when she is set to arrive at her destination. Figure Drawing Studio is a VR prototype for an application that allows both artists and non-artists to improve their skill at capturing the human figure. The concept is a virtual practice environment where multiple people can join the same space and practice drawing a posable 3D figure on individual canvases. These canvases can be grabbed and moved around to practice different perspectives of the form, and the user would be able to move around to observe and learn how others draw. Since it is generally said that drawing from real-life observation compared to a 2D photo is more effective for a number of reasons (e.g. being able to move around your model to gain a better understanding of 3D form), not everyone has access to figure drawing sessions or someone to pose long periods of time for them. In my experience, the group aspect of a drawing session where multiple people draw the same subject together is also extremely valuable since peers can provide critique, tips, and inspiration. This is where the advantages of virtual reality make this experience possible. Motivated by a desire to create this tool and practice my own figure drawing skills, I used Unity to build a rough VR prototype of Figure Drawing Studio over a weekend. 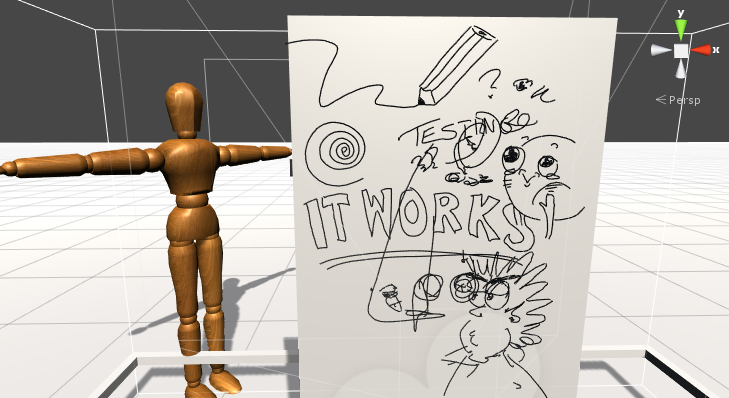 The initial prototype has a working canvas, a 3D mannequin, and a pencil tool with undo / clear features. The key factor to making this project successful is to make the experience of drawing on a canvas as accurate as possible, which I found to be challenging because of the lack of a physical surface when drawing in VR. However, it would be interesting to conduct user tests to find out if this tool can actually be effective at improving drawing ability. Future work will include multiplayer integration and continued improvement of the drawing mechanics to make it feel more like charcoal drawing. When cooking from an online recipe, it is often inconvenient and cumbersome to juggle cooking tasks and smartphones in order to navigate potentially complex cooking instructions. Touch based interactions can be a problem when the user’s hands are occupied or dirty. Mr. Chef is a paper prototype for an app that communicates between smartphones and smartwatches in order to deliver cooking instructions on the fly with hands-free navigation. Users are able to browse from a database of recipes with different sorting options such. When the user selects a recipe to cook, the app syncs with a smartwatch and allows the user view the instructions step-by-step. Simple gestural “flicks” navigate forwards and backwards through the recipe, creating a streamlined cooking experience.